High Tech Cooling - Highest Quality! Made from high-density foam, this material is laminated between two Mylar layers to produce the ultimate in-protection. 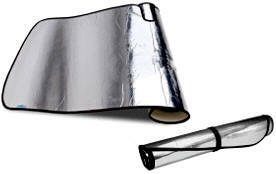 The outer Mylar layer is aluminized to reflect UV rays, while the inner layer adds toughness and provides protection to the middle foam layer. These three special layers of reflective Mylar foam combine to provide the best insulation against heat and UV rays. This Coverking Custom Sunshield is completed with a black-felt edging. Moisture vapor will not get trapped under the sunshield as our shields are highly breathable. The inner layer softly caresses your windshield without scratching the contours. Plus, our Sunshield is eco-friendly as well as hypo-allergenic. Easy to store and clean, our Sunshields are installed with no effort and are guaranteed for one year.